The private estate and wedding venue has been developed in recent years around an 18th century corn and flax mill village. Ballymagarvey has 107 acres of parkland and 50 acres of woodlands, set out in walks and picnic areas. It is an oasis of peace on a weekend like this, yet is just 25 minutes north from the M50 at Balrath Cross and on the N2 midway between Ashbourne and Slane. Ballymagarvey is the name of a parish in the barony of Upper Duleek, Co Meath, six miles south of Slane and on the banks of the River Nanny. The main house, which has been lovingly restored, is modest, homely and warm and its nine rooms of five-star quality are luxurious. The seven courtyard cottages and schoolhouse rooms are all finished in traditional style, with both charm and comfort in mind. The accommodation is tucked away at the end of a long winding avenue and is not overlooked on any side. Local lore says Ballymagarvey takes its name from a mediaeval bishop named Magarvey or McGarvey. In later years, Ballymagarvey was owned by many notable local families, including the de Verdun family, Sir Christopher Bellew, Elizabeth Wood and Francis Fleetwood. When the Aylmer family came to live in Ballymagarvey House in the 16th or 17th century, they built a corn and flax mill village, with a pond, millrace and the beautiful cut-stone buildings that once housed the granaries. 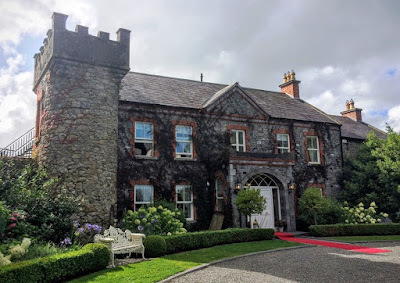 Many other couples started their married lives here, including Thomas and Melinda Osborne, Robert and Henrietta Clouston, Sir Thomas Ainsworth and Lady Edina Hope Conyngham, daughter of the Marquis of Conyngham of Slane Castle, who were married in 1911. I was at Ballymagarvey House yesterday [19 August 2016] for the wedding of my niece, my only goddaugher, and stayed here overnight. Ballymagarvey House was built in the early 19th century for Melinda Osbourne who had been acquired 444 acres. The nearby Somerville Estate extended to 8,000 acres. When Samuel Lewis visited the area in the early Victorian period, the parish had 401 inhabitants, and Mrs Osborne was living in the house. Her neighbouring landowners included Mrs G Tandy of Balrath, Lawrence Cruise Smyth of Snugborough, and H Smith of Mullafin. The vicarage was then part of the union of Kentstown, and the heirs of Sir Andrew Aylmer were patrons of the rectory. I first visited Balrath About two years ago to see Balrath Cross across the road from Ballymagarvey House in the cemetery surrounding the ruined church. Balrath Cross is a 16th century Wayside Cross and was moved several years ago to its present location because of road widening around the corner at Balrath Cross. The east face of the cross is carved with a Pieta or image of a seated, weeping Virgin Mary with the body of the dead Christ resting in her lap. Below this image is a Latin inscription asking for prayers for the soul of John Broin, and below that again is a later inscription in English saying the Cross was ‘beautified’ in 1727 by Sir John Aylmer and his wife Catherine. This was Sir John Aylmer, 3rd Baronet, of Balrath, who died in 1714. On the west face of the cross, a crucifixion is carved on the upper portion, with small knot carvings beneath. At the ends of both arms there are carvings of two masks, and there are several other smaller carvings on the cross. The graveyard surrounds the ruins of Ballymagarvey Church, which dates back to 1658. Ballymagarvey Cemetery is probably much older and may have been more extensive before it was enclosed within its present walls. The Aylmer family of Balrath was part of the ‘Old English’ community of the Pale that largely remained Roman Catholic. Sir Christopher Aylmer (1620-1671), who married Margaret Plunkett, lost his lands and estates in Balrath during the Cromwellian era. But he recovered them at the Restoration of Charles II and in 1662 he was made a baronet. He was the father of the naval officers Matthew Aylmer, who became distinguished admiral, and George Aylmer, a naval captain who was killed at the Battle of Bantry Bay in 1689. Admiral Matthew Aylmer (1650-1720) was given the Irish peerage title of Lord Aylmer, Baron of Balrath, in the County of Meath, in 1718. His only daughter, Rose Aylmer, went to live in Wales in 1785 when her widowed mother, the former Catherine Whitworth, married Howell Price in Armagh and they moved to Pembrokeshire with her daughter and four sons. In Wales, the 17-year-old Rose met the young and aspiring poet Walter Savage Landor (1775-1864), and they enjoyed walking together in the Welsh Hills. However, her family sent her to India a year later in 1798, to join her aunt Anna, wife of Sir Henry Russell, Lord Chief Justice of Bengal. It was a move to remove her from a man her family regarded as an unsuitable suitor, but she died tragically of cholera in Calcutta two years later on 2 March 1800. She was only 20, and local people said she had died from eating too many pineapples. At the time, eating pineapples and other fresh fruit such as watermelons was believed to be one way of contracting cholera, and many places banned the sale of pineapples and watermelons during outbreaks in an effort to stop cholera from spreading. In this inclement clime of human life. What, every virtue, every grace! Rose also inspired Walter’s poem Gebir, having loaned him The Progress of Romance by the Gothic author Clara Reeve which contained the story of The History of Charoba, Queen of Egypt, on which Gebir is based. The present holder of the family titles is both the 16th baronet and the 13th Lord Aylmer. Another branch of the family lived for generations at Donadea Castle, near Donadea, Co Kildare. Meanwhile, I wonder whether they are going to offer any pineapples or watermelons at breakfast in Ballymagarvey this morning.